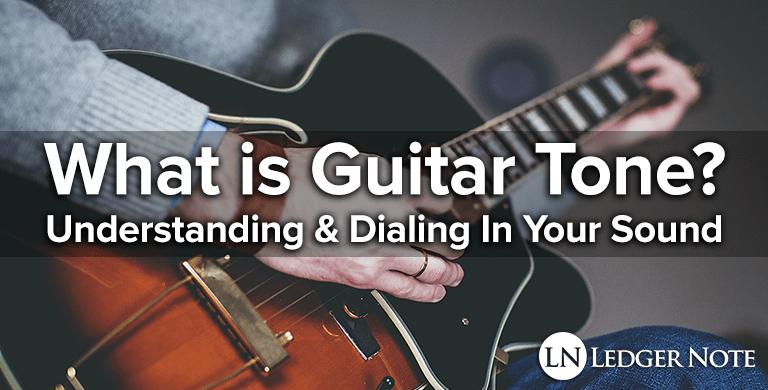 Depending on who you're talking to, you'll get various definitions on what tone is and where it comes from. Many purists will even tell you where it should come from, too. The reality is that various genres of music and guitar playing are accepting of more and more layers of signal processing and effects, and the more that they use regularly the more forgiving and forgetful they are of ways to control your tone earlier in the signal path. Many players, such as jazz and classical players, will tell you that your tone comes from your fingers and how you hold your pick. Others are more concerned with the shape of their acoustics and how they project the sound, while an acoustic-electric or straight electric player is going to be more concerned with their pickups. Of course, when you get into rock and metal, it's going to be all about effects pedals. Our goal today is to explain precisely what tone is and the many ways you have of controlling it to create the experience for your audience that you intended. What you'll find out as you read along is that all of the various types of players are correct. There are a lot of ways to achieve the sound you desire. Guitar tone is the sound that is the end result of the way your pick or fingers strum a properly maintained guitar and its strings, through all of the various electronics used to shape the signal, and ultimately broadcasted out of an amplifier. Your tone can be more or less affected by every aspect of your guitar's build, how well it is maintained, the on-board electronics, any effects pedals, and the type of amp you're using. Your tone, then, is the final product of the combination of all of these items as your signal passes through them and finally out to human ears. Let's take a quick look at how each of the following stages of your guitar's signal path affects your tone and how you can use them to your advantage. As is said truthfully, "Tone starts in your fingers." This refers to fingerpicking acoustic guitar and the way you hold your pick when playing electric guitar. Everything else is built upon the simple fact that something has to make the guitar strings vibrate and that boils down to the above two options. You won't be able to suddenly gain extra fine motor control in your fingers and hands. This comes with time. But what you can do is practice correctly with techniques that will lead to the tone you're trying to develop. Aspects to consider are how tightly you hold the pick, how deep you allow it to penetrate between the strings, the angle at which you hold it, and the thickness and flexibility of the picks. Most of these points apply to your fingers, fingernails, or fingerpicks as well. 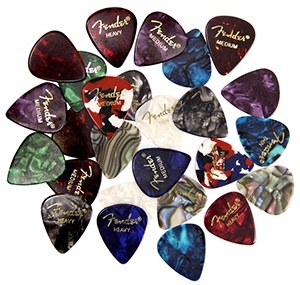 Fender has a great grab bag of picks featuring every gauge of thickness for you to try. Obviously the type of strings you use will make a huge impact on your tone. You have your classical, flamenco sounding nylon strings and you have your nickel-wound strings that provide more of a vintage sound. You can step into the brighter sounding stainless steel strings and enjoy their longer sustain. The type of winding can matter as well. Flat-wound strings are warmer and richer yet mellow, while round-wound strings are very articulate and crisp. If you choose to use coated strings this can have an effect as well. If you want to learn more, we talk all about guitar strings here. In general, this is an area where you can narrow down your selection based on your guitar and your preferred genre, and then test a few of the popular choices and settle for a while until you learn more. Acoustic-electric guitars using piezoelectric pickups or microphone systems generally are stuck regarding this stage. Their only choice to change their tone is to switch to a new pickup. That is an option for electric guitars as well, although it's rarely necessary since we have so many other options, including ways to change the tone at the pickup. There are differences between passive pickups and active pickups, where active ones require a battery to power them. Passive pickups typically are single coils that have a less powerful output and will have a 60 Hz hum that has to be dealt with. The benefit is that they can provide a very articulate and clean tone due to their brighter frequency response. Active pickups, usually with double coils called 'humbuckers,' are great for players looking for a thicker, hotter signal to distort and those that aren't interested in dealing with the 60-cycle hum. Active pickups on a guitar can come equipped with a full on three-band equalizers, and passives usually only feature a tone knob, which is a low pass filter that cuts out higher frequencies to help you achieve a more warm tone. All of this discussion is generalized and doesn't hold true for all actives and passives, single coils or humbuckers. There's a lot of new technology out there that in breaking conventions, but this is the general understanding that most players have. So your choices here are in the type of pickup you use, if it is powered or not, and how you choose to affect the tone with the tone knob or equalization options. It should be mentioned that the volume knob will play a big role in your pickup tone as well. Whether we're talking about the volume knob on your guitar, a gain pedal, an overdrive pedal, or a distortion module, these are all types of gain that increase the ratio of your output volume to your input volume. But they can all affect your tone in different ways, especially depending upon which stage of the signal path your in. The volume knob on the guitar can affect your tone in a lot of ways. It can compensate for a loss in volume and articulation from your tone knob being used to warm up your signal. It can also indirectly shape the envelope of your signal if you have a compressor pedal down the line. This all applies to gain pedals as well. Both of these will supply 'clean gain' that doesn't introduce distortion unless you drive the next piece of gear's input too hard. You'll need to learn about gain staging to defend against unwanted distortion. You've likely heard different terms for distortion, such as 'distortion,' 'fuzz,' and 'overdrive.' These terms all refer to the act of distorting your signal by increasing the volume until clipping occurs. This clipping can be a pleasant sound that introduces interesting artifacts to your tone, especially desirable in hard rock and metal genres. The difference between them is that distortion is a hard-clipped waveform while overdrive is soft-clipped. Hard-clipped is like a square sine wave for a synthesizer while soft-clipping is more like extreme compression, still featuring a slight curve to the waveform. Fuzz is a hard-clipped wave but asymmetrical where the top of the waveform is clipped off more than the bottom. The amount of gain you introduce, where you introduce it, and of which type can greatly affect your tone. Having covered distortion pedals above, let's look at some other types of effects that can change your tone. Equalization is by far the most powerful method of changing your tone because it can boost or cut portions of your frequency response altogether. EQ for live guitar should be used with very wide Q's, typically with only three bands associated with bass, mid-range, and treble. The second most powerful tone control pedal you'll use is for compression. Compressors reduce the variation in volumes between the peaks and troughs of your signal so that the average volume is more consistent. This is important to make sure you cut through the band intelligibly as you play. You can also shape the envelope of your waveform using the attack and release functionality. 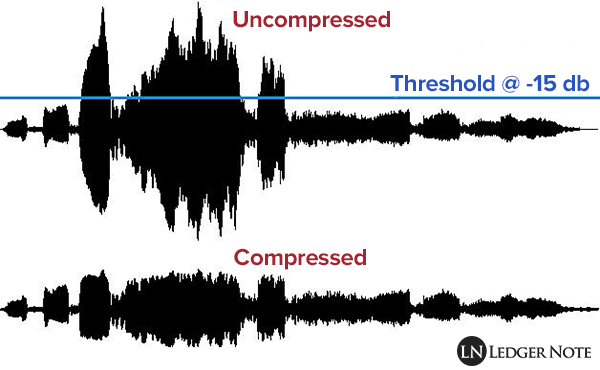 You can learn more about how all of this works in our article on compression. Beyond these, you have the time-based effects like reverb and delay and the space-based effects like chorus and flanger. These aren't strictly tone controls, in my mind, but literally sound effects. You may see it differently and they can certainly affect the way people perceive your sound, so you'll definitely want to explore their usage. And finally we come to the last part of your signal chain, the almighty amplifier. This is one of the most enjoyable and enraging aspects of guitar tone creation because there's no truly neutral amp out there. Yes, there are clean and nearly transparent amps, but they will all impart a piece of themselves onto your signal. Each has characteristics and colors that make them unique, but you can predict what these characteristics are based on how the amp is built. Tube amps, which you'll sometimes see called 'valves,' feature vacuum tubes in them. Many players prefer this for the relatively extreme coloration you get in your tone as opposed to solid state amps. Tubes apply a natural smoothing sensation to your high frequencies and a bit of compression as well. But most importantly are the sustained overtones that are added to your signal when a tube is driven optimally, which are very pleasing harmonics that provide a pleasing sense of fullness to your tone. The only downside to tube amps is that you need to respect the fragility of the tubes. Solid state amplifiers will be your more neutral option unless designed to be less transparent. While solid state amps also provide harmonics, albeit of a lower order, they also don't feature the sustain that you'd get out of a tube. This may be preferable and of course can be remedied by effects pedals when desired. You may be asking which of these two types of amplifiers are better, and the correct answer is "neither." It depends on your preferences, which you'll have to learn over time. What Can We Do To Ensure Our Best Tone? If you aren't taking care of the basics, trying to extract an amazing tone out of a shoddy setup is like putting make-up on a frog. Even if you dial in the perfect version of your preferred tone, it may not sound the best that it could. So what can we do to make sure we're not sabotaging ourselves right out of the gate? First and foremost we need to make sure we're doing proper guitar maintenance and care. This means we're cleaning and conditioning our guitar, changing our strings in a timely fashion, and visiting a guitar technician for an intonation and setup. We want them to check out our pickup heights, neck alignment, adjust our truss rod, file or boost our nut, and make sure we're storing our instrument in a way that keeps humidity from damaging it. Every piece of gear you have has connections that have cables running between them. These jumpers and connectors can fray or become dirty, introducing noise and artifacts into our precious tone. You don't need a 100 foot cable that is susceptible to signal loss and electrical interference when you never stray more than 10 feet from your pedal board. Clean the jacks and pots on all of your pedals and check them all to make sure each is performing optimally and as designed. We all use old, beat up pedals we've stepped all over. Just make sure the internal electronics are still good. It's fine to have 25 pedals spread out in front of you, as long as you understand how to use them and have connected them in the logical serial sequence. For instance, you should be equalizing before you compress and adding reverb after compression. These things become obvious as you think about them or realize through trial and error that compressing reverb sounds like crap. One thing you need to check is that your pedals are using a true bypass when disengaged. Otherwise your signal will still flow through the pedal instead of straight from the input to the output, and even if the effect isn't applied, your tone will be changed by the pedal's color. The worst part of talking about tone with other players is nobody is sure they're describing the same things because it's all so subjective. We tend to make up terminology on the spot in our desperate attempt to communicate about the sounds we're describing. The best we can do is list these terms so you're familiar with them and their general meanings for most people. Articulate: Relates to intelligibility where each note can be heard as a distinct event without smearing. A sense of separation with a clear note attack. Brittle: Too much treble, especially in the upper high-end. Can cause actual discomfort to the listener and ear fatigue quickly. Crisp: Clear treble on the high-end of the high frequencies. Bright and sharp, but not unpleasantly so. Crunchy: A warm, full spectrum sound with a thick and slight distortion. Dark: Far less high-end with an exaggeration below the realm of 'warmth.' An accentuated bass response with a lack of treble. Muddy: Too much lower mid-range and warmth. It is unintelligible and boxy sounding. Nasal: Too much presence of mid-range frequencies to the point of losing articulation and intelligibility. Close to 'honky' as well. Open: A full spectrum signal with more weight in the high frequencies that provides a sense of articulate spaciousness and air. Punchy: Articulate in the high-end but accentuated in the low-end for an expressive sense of percussion. It is a tight and responsive sense of power with meat behind it. Scooped: The opposite of 'nasal,' lacking in power in the mid-range frequencies. Exhibiting too much low and high-end. Smooth: A slight roll-off of the high frequencies with a bit of extra warmth. Can imply a compressed signal with a soft attack. Throaty: A full spectrum signal, weighted slightly towards the low-end with a bit of growling distortion. Warmth: A pleasing balance of low-end and mid-range frequencies while still maintaining a lower amount of high-end clarity. Woody: Like 'crunchy,' it is a slight amount of break-up leading into distortion with less mid-range frequencies. Described as hollow instead of thick. That's a pretty good sampling of some of the jargon you'll hear. Beyond that you have geographic, genre, and company labels such as American, British, Bluesy, Vintage, and words related to Fender, Gibson, and Marshall, too. They all describe the conventions and trends of the gear used in those regions or genres. This is typically all any guitar player needs to know about tone. Sure, there are tricks about riding your volume knob, changing the tubes in your amp, and other fun methods you can explore once you have the basics and intermediate tactics down. When you start hunting for your own custom tone, you can identify a player who has the sound you like and attempt to recreate it. That might mean that if you're a metal fan, you start emulating your favorite heavy player while using the best guitar for metal you can afford while recreating a similar signal path through effects pedals until you have a handle on it. That's a fast way to become accustomed to all of these various methods of tone control. Soon, you'll know it all like the back of your hand and can summon up various tones on the fly and not feel like you need to be associated with any one sound. Let your playing define you, not your guitar tone.